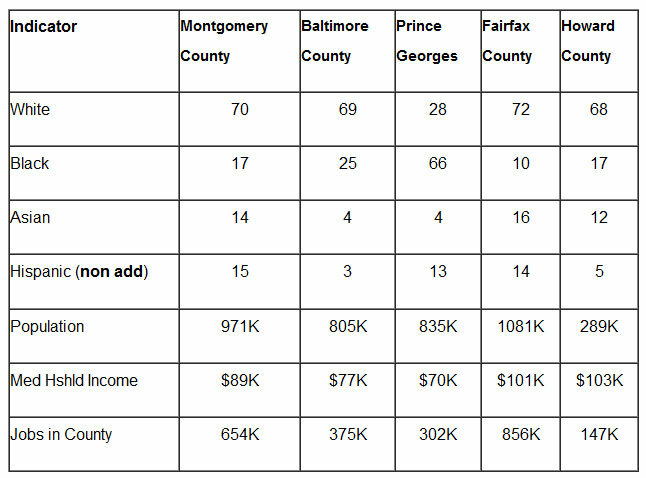 GAITHERSBURG PATCH: Families with young children in Montgomery County must earn at least $64,000 a year just to cover their basic needs without government aid -- about a 50 percent increase over the past decade that makes the county more expensive for working families than New York City and San Francisco, a new study says. The study was done by University of Washington researchers, who calculated a "self-sufficiency standard" for each county based on family make-up and the local cost of housing, food, childcare, transportation, taxes and other essentials. Montgomery County planning director Rollin Stanley said in his blog earlier this month that many people in poverty are employed -- some work part time and others full time, and some have high education levels. According to the Planning Department, Montgomery County has 15% fewer adults between the ages of 15 and 24 than we did in 2000. There are 17% fewer 25-to-34 year olds, along with 20% fewer 35-to-44 year olds. The first two age groups belong to the Millennials (or Echo Boomers or Generation Y, whichever you prefer). As I've said before, we're now the largest generation in American history, due to being the kids of the Baby Boomers, America's previous largest generation. Yet their ranks in MoCo have swelled over the past 10 years, while my cohort has shrunk. Some of my readers didn't agree with my post last June about my newlywed friends who grew up in Montgomery County then moved elsewhere in the region. A lot of people didn't like my post last week about the difficulty of finding housing in MoCo for Millennials, which now has over 200 comments on Greater Greater Washington. But these things are connected. Montgomery County is an expensive place to live, and some of us (like my friends) have found that neighboring communities have more jobs, cheaper housing, and more stuff to do. But if 30% of the county's population is over 65, as the Planning Department estimates will happen by 2030, we're not going to be able to manage. If we want the county to continue prospering, we have to draw young people. "What" draws young people is pretty simple: Jobs, reasonably priced housing, short commutes, proximity to shopping and entertainment, and increasingly, neighborhoods where you can walk/bike/take transit instead of driving. JUST UP THE PIKE: Takoma Park has long been known for their civic activism, dating back to the freeway fighters that stopped I-95 and I-270 from cutting through the area forty years ago. But that culture could prevent their community from allowing good changes to happen. Well-designed urban infill development in places like Old Town Takoma can get people out of their cars and bring customers to the area's struggling local businesses, which presumably are progressive ideals. Not allowing development to happen effectively enables all of the things progressives say they don't want, like more driving, more gentrification, more suburban sprawl and more destruction of farmland. Those who know Maryland Juice's politics know that I wholeheartedly agree with the idea that environmentalism and progressive politics today go hand-in-hand with an understanding and embrace of transit-oriented development, urban infill, and expanding metro access to as many as possible. I would clarify, however, that at least some of the progressives who continue to fight smart growth development are often well-intentioned -- they just haven't all caught up to the radically different social justice and environmental considerations that have emerged today. Additionally, in past decades, many of their complaints would have been valid -- and many of the battles against unchecked development and highway growth may have been wise. But that doesn't change that today, DC's adjacent metro-served communities are commodities for our regional environment -- not just the immediately surrounding neighborhoods. In fact, one can already witness the greenfield development pressure up the I-270 corridor -- stretching into Frederick County (where English is now the "official language" -- whatever that means). In a very real way, constraining growth near transit in Montgomery County has a very real effect on plowing over farmland in Maryland.